Today we combined our Week 23 and Week 24 a little bit. We are heading to a special field trip next week for Wonderful Wednesdays (more to come on that next week). 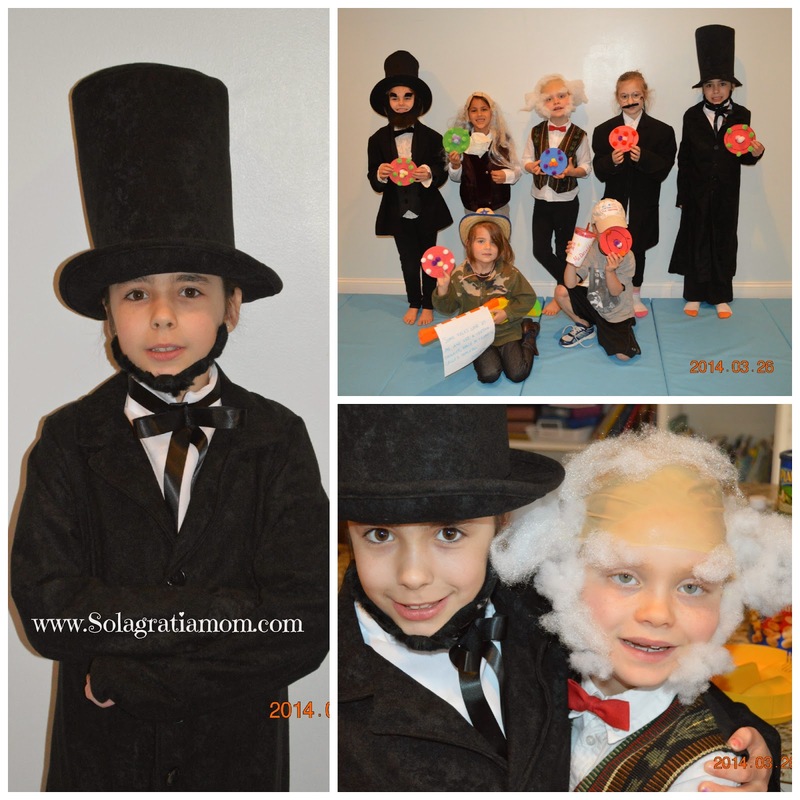 So for dress up we did Presidents and then we focused our memory work on the way heat flows - conduction, convection and radiation. 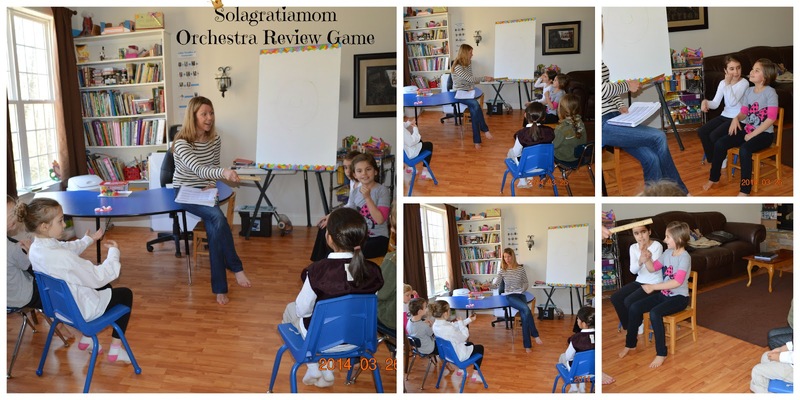 If you want to see the Orchestra Review Game I made up - skip down to the bottom of this post! 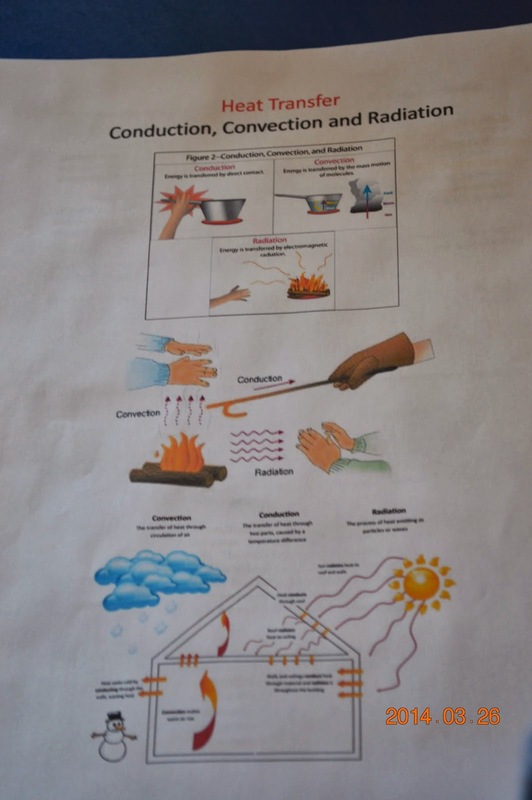 We talked briefly about conduction, convection and radiation and I showed them a handout as we identified and discussed the pictures. Our resident scientist, had the kids blow at each other and said "that's convection". Then she had them rub their hands together fast till they got warm and said "that's conduction". Lastly, they talked about standing in the sun and feeling hot and that was identified as radiation. We started with an easy experiment -you just needed some ice, a plastic top and a metal top. The first thing we did was divide the kids into teams of two. We had them "race" their partner. They predicted beforehand, whether or not they thought the plastic would melt a piece of ice quicker than the metal. I tried to trick them by talking about how much "warmer" the plastic top felt to me, than the metal top and asking them if they thought that would make it melt faster. Most of them weren't fooled. They understood that conduction would mean that the metal pot top, would melt the ice faster (they remembered the experiment we did a few weeks ago with the spoons in hot water). After they each got their ice, they put it on their lid at the same time and "raced". Sure enough - the metal lid melted it right away. We next, did a demonstration with a balloon, water and candle. I laugh every time I think of this. The kids started out, as you can see by the picture of the kids all very close to the balloon and candle below, not knowing what to expect! The balloon blown up with just air, was the one we started with and placed it over the flame, as little eyes watched carefully. After a couple seconds, it POPPED of course! The kids were NOT expecting that (hmmm…makes me wonder what they thought would happen). Then, when we blew up the balloon with water inside of it and placed it over the flame, the kids were standing well back, some with ears plugged - even one cutie watching from inside the bathroom, ready to slam the door shut as soon as it popped! LOL! Of course, the one with the water in it, did NOT pop. We discussed our results and the reasons why, with the kids. The next thing we did was try an experiment on convection, using a small glass container, large container, food dye and tin foil. So first we boiled water and put it into the small container with several drops of food coloring. 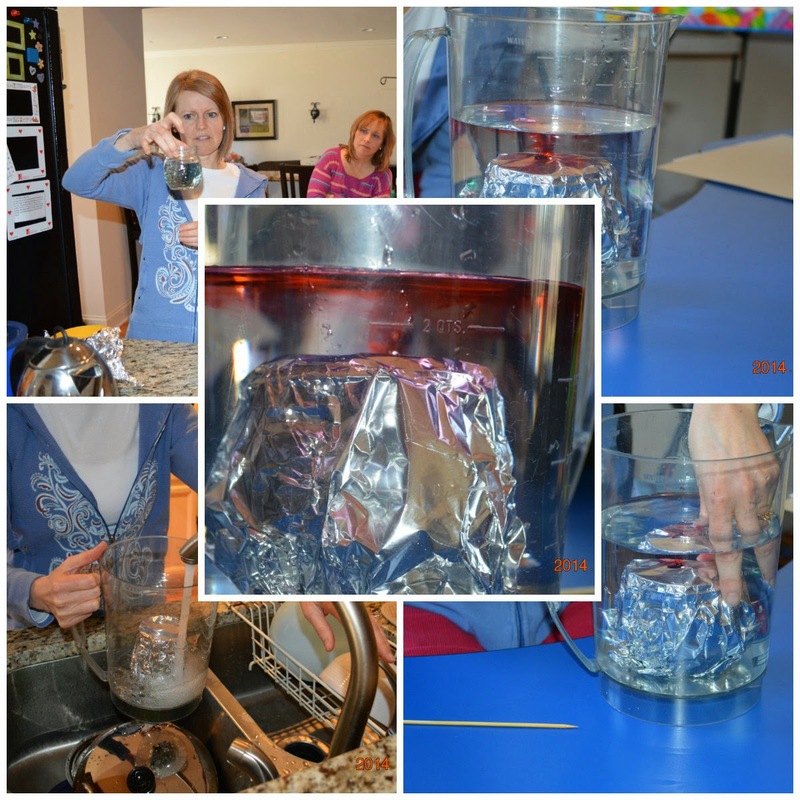 Then we covered the small container with tin foil all the way and placed it inside our large container and then filled it up with water, to cover the small container with about double it's height in cold water. After that I used a skewer to poke a hole in the tin foil and the kids watched as the hot water flowed into the cold and eventually, through convection, they mixed. We did this twice - the first time it didn't have dark enough food dye coloring in it to show well. Then we used red and it worked great. Then we did a demonstration using popcorn, to help the kids understand convection, conduction and radiation. We first put popcorn into the air popper (which once I pulled it out, we realized it really didn't use air to pop! So we talked about it), the microwave and the stove top. 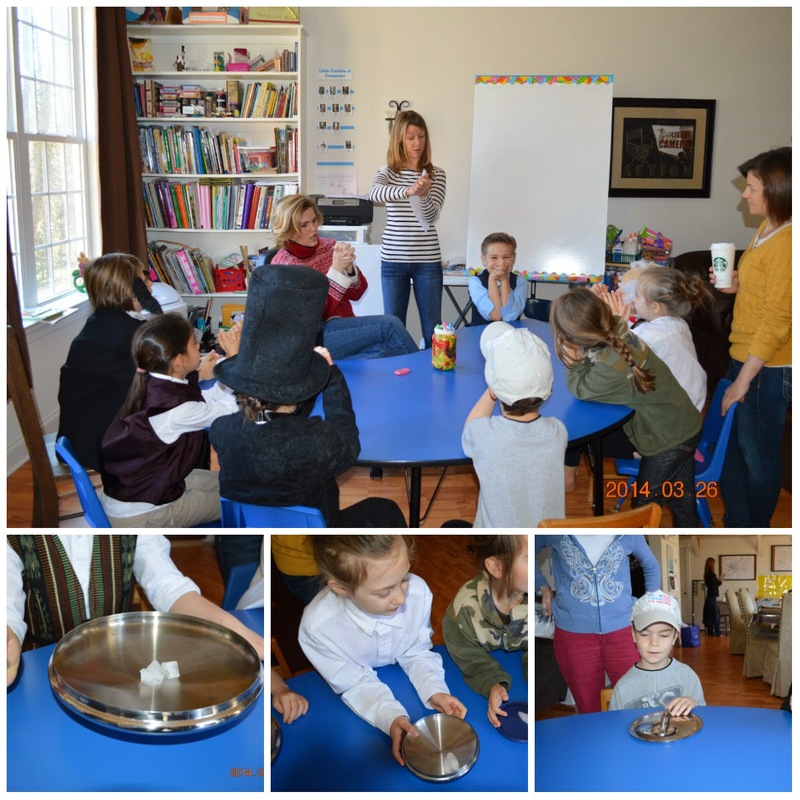 We talked about how the various methods of cooking the popcorn worked. Air popper uses convection, stove top uses conduction and the microwave uses radiation. Later we would eat the results of our experiment and see if there was a taste difference! 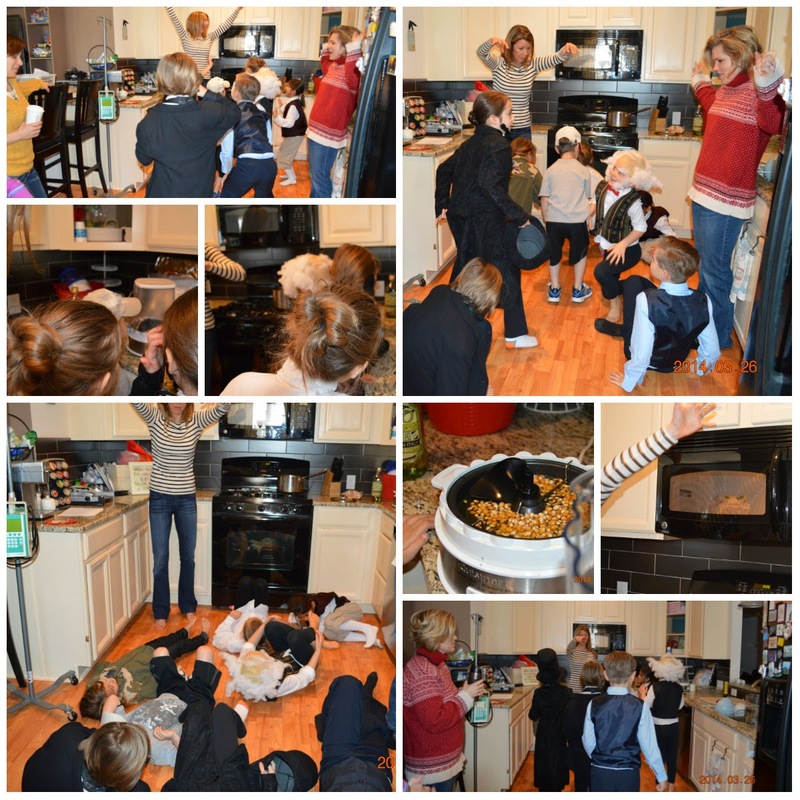 Then we had the kids become popcorn kernels by laying down on the floor. Then we "heated" them up and had them begin to "pop". Silly fun. Next week, we are going to be heading to a Nuclear Plant to learn about how they work, as part of our week on electricity, so we felt some introduction to the atom would help them at the tour next week and understanding better what they will be hearing/seeing. So our awesome resident scientist, introduced them to the idea of the atom by using the analogy of a pizza. She asked them what their favorite toppings on a pizza were and then drew a circle to represent the pizza and an inner circle to be where the pizza toppings they liked would go. She used P's to represent the pepperoni and then N's to represent the second topping. She put + signs for being "positive" since they like those toppings. Then she drew another outer circle and said that these would be the toppings they don't like and put (-) negative marks for those toppings that they didn't like, increasing by 2's as each outer circle was drawn, till we got to 8 (-) marks. 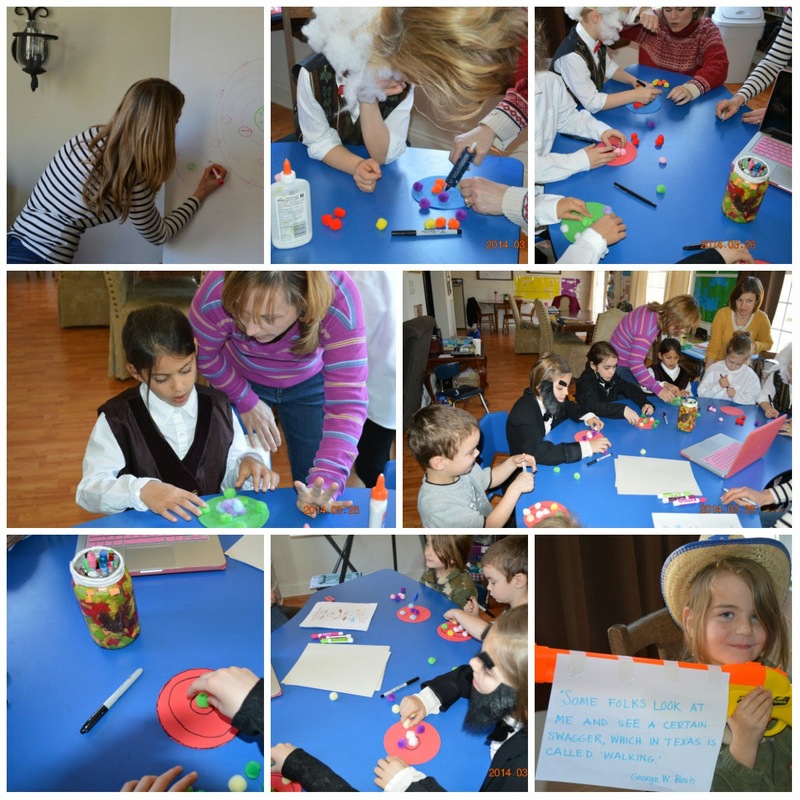 Then we had the kids make their own atom using pom-poms and black markers with hot glue. They drew their nucleus and some outer rings and then glued pompoms in two different colors inside the nucleus to represent protons/neutrons and then glues a different color for the electron rings. It was a brief introduction to just get them to see that an atom as protons and neutrons in the nucleus and is surrounded by rings of electrons. We wanted them to be exposed to the idea of positive and negative charge as well. We also watched a short video about nuclear energy. 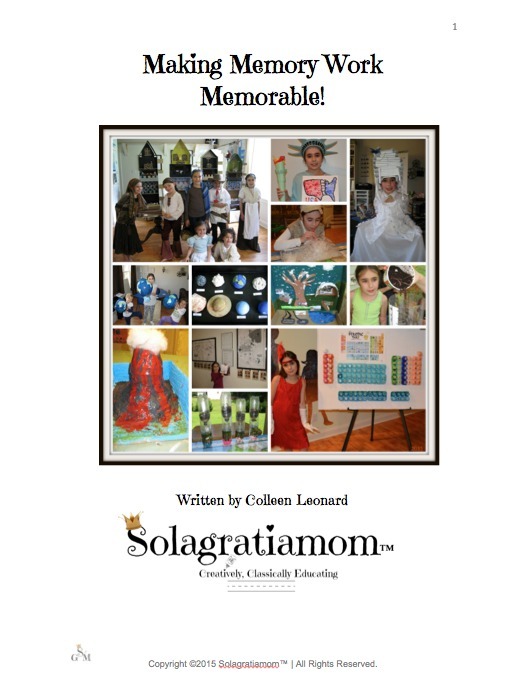 To end our time together, before we ate the labors of our conduction, convection and radiation experiment; we played a review game - Solagratiamom™ Orchestra Style! The way this is played is - you break the kids up into "sections" of the orchestra and then you become the Conductor. You ask a review question and then you "play the orchestra" by sections or in full, by moving your baton between them, back and forth, section to section and at times playing them in full orchestra, as they recite or sing the work back to you. They have to all be listening because they don't know if the baton will be pointed to their section causing them to pick up mid sentence, as the Conductor moves between sections at will. :) Lots of fun! We of course, had the kids "air play" their instrument sections to go along with the fun. Our percussion was pretty lively! We ended our time enjoying the outcome of our various methods of cooking popcorn! We just had popcorn to go with our family movie, I'll have to pull out some of your ideas next time! 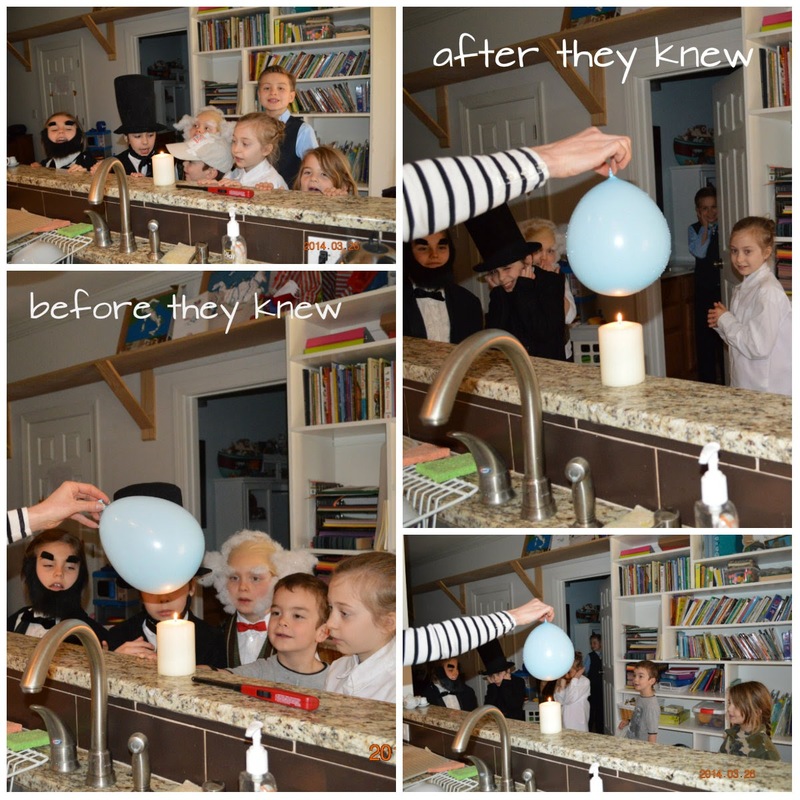 I love the pictures of kids gathered around the balloon before and after they knew what would happen. I hope they will be a hit with your family next time! I still laugh when I think of that scene with the balloons. ;) Thank you for viewing! Thank you Mary! We do have a lot of fun! I highly recommend educating in Community with close friends! 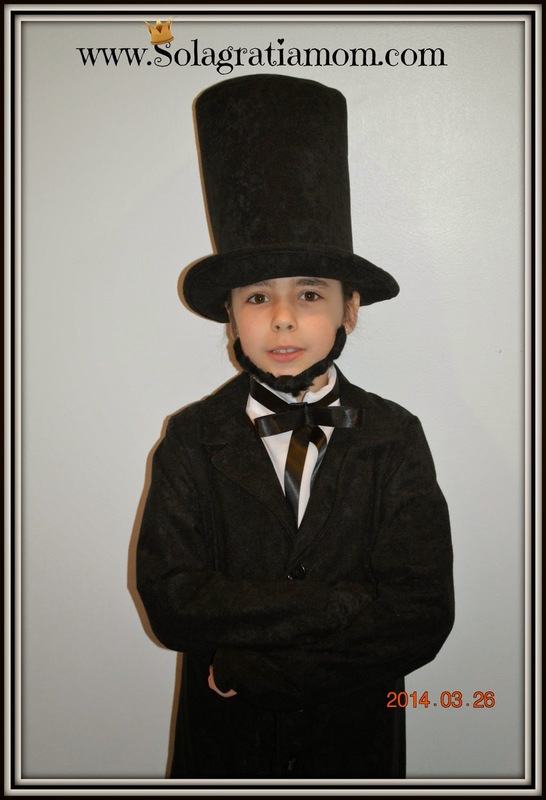 Thank you - both Abe's were cutie patooties! HA HA I love the costumes this week! These are such great memories for those kids! Thank you Heather! We had lots of fun! The kids are too cute and fun! I make a blog to yearbook for my daughter each year - it's great to look back over it each year after we've done it! Have a terrific Lord's day! I learned about conduction, convection and radiation in my college heat transfer class. It was difficult and understanding the concepts beforehand would have been a big help. Kudos to you and your group for tackling these difficult subjects each week and encourage science education. When we put our water balloons into a warm swimming pool they popped. I bet yours would pop if you put them in a tub of warm water. Do you have a follow by email button? I'm lazy and like to get emails. They're easy to add if you don't have one already. It's under add a widget or gadget, or whatever it's called in the layout section of blogger. I tried to leave a comment on iPad but it didn't seem to work, so forgive me if you get multiple copies of this message! These activities are great! You never cease to amaze me with your creativity! Thanks for sharing this info and inspiration! I'm going to try some of these experiments with Jeremiah this week!